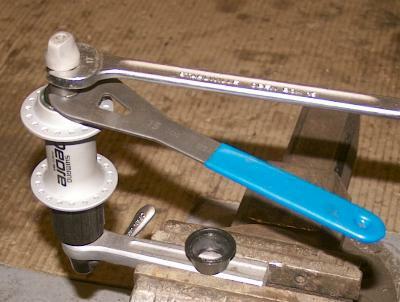 To check if the rim is centered over the locknuts you use a dishing gauge. 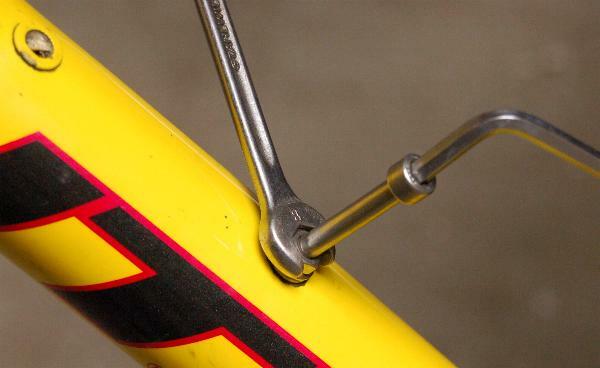 Put the gauge againts the rim and move the pointer to the locknut. Flip the wheel over, and if your wheel is accurately centered ie symmetrical you get the same reading. If you get a gap the centering is of by half the amount. 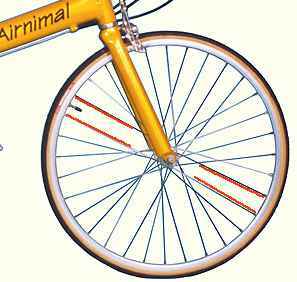 A dishing gauge is to be prefered over relying on a truing stand which will usually be slightly off. The powerlink for Wipperman Connex chains is supplied with a large sheet of instructions. 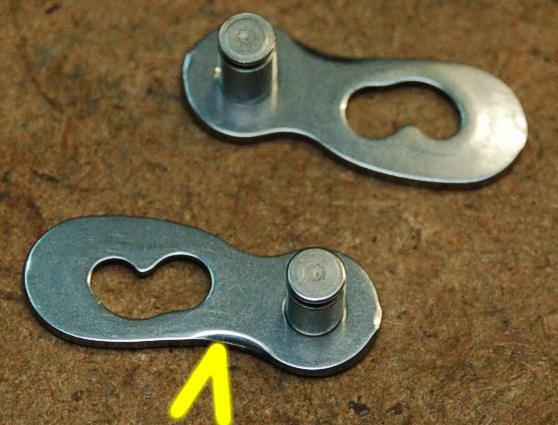 These are needed because mounting the asymmetric link upside down could cause skipping on the 11T cog. However I could never remember the correct orientation with the instructions supplied. Once you know how it is easy though, as only one side of the link is chamfered to facilitate shifting (arrow). Mount this side facing the teeth on cogs/chainwheel. 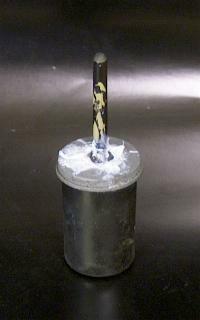 Rivnuts are used in alloy frames to fit the bottlecages. 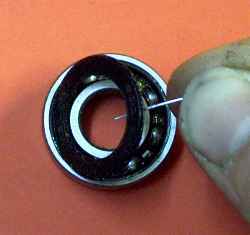 They consist of a hollow rivet which expands when you pull up the threaded bottomsection. 1 is an uninstalled rivnut, with the expanding section outlined in red. 2 is the rivnut installed, with the arrow pointing at the formed shoulder. 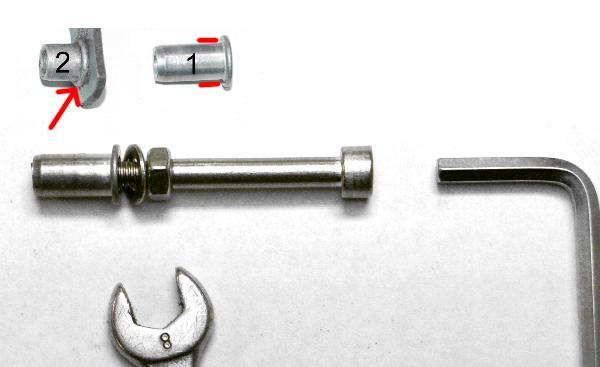 For installation you need a special tool, but a ratling rivnut can often be tightened up with a bolt, washer and nut. Screw down the bolt in the rivnut as far as it will go by hand. 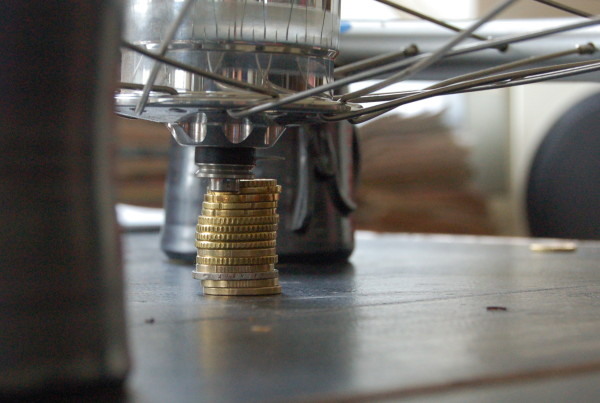 Spokes inserted in steel flanged hubs (eg Hubgears) usually benefit greatly from using spokewashers to improve the fit. Putting a tiny washer on every spoke is however a fiddly job. 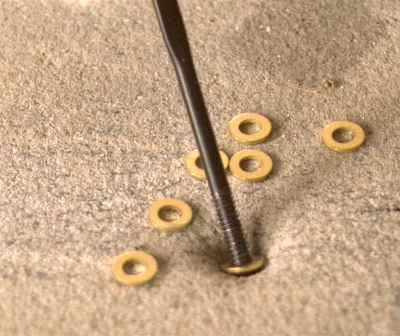 It becomes much easier if you place the washers on a flexible surface (here a rubber sanding pad) . You can now spear a washer in a single movement! Hydraulic brakes use either mineral oil (Magura, Shimano) or automotive brakefluid (e.g Hope). The mineral oil is available in very small bottles (Magura Blood) or als LHM (Citroen suspension) oil at the motorfactors. 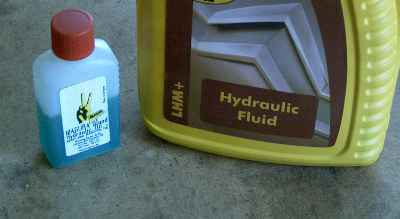 Motorfactors also sell brakefluid, but as this is hygroscopic it is best to buy this in small quantities. For storage squeeze as much air out of the botlle as possible and screw down the top tight. Never use oil in a system designed for brakefluid or the other way round as this will destroy the rubber seals. Systems filled with DOT 5.1 can be used with DOT 4.0 (after flushing with mineral spirits), but never with DOT 5.0! As long as the wheel doesn't have radial spoking, you can see it at a glance. Removing old handlebartape can be very timeconsuming. Especially cork-tape has a tendency to tear, which means you have to remove numerous small bits. Take an electrical heatgun, and blow hot air through the bar. Be carefull not to start a fire. Start unwrapping the tape when it feels warm to the touch. Removing grips can be a bear. Some people manage with brute force, I prefer more subtle methods.Take a syringe (ask your vet, farmers shop, local junkie ;) w.h.y. ), and fill it with meths. 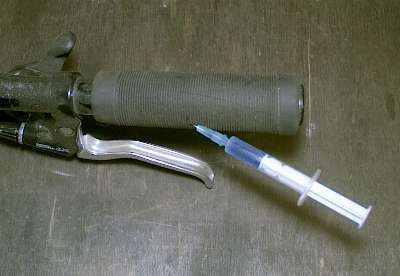 Insert the needle through the grip and squirt some liquid between grip and bar. Massage the liquid along the grip and it will loose adhesion. You can now slide the grip of without trouble. To refit, wet the inside of the grip with again methylated spirit, it will slide on without fuss, and once the spirit has evaporated the grip will be tight again. Instead of meths, water will work too but it will take longer to evaporate. A pot of grease on the workbench easily becomes a mess. Adding grease to some part isn't very convenient either. Both problems are solved with a large (50ml) disposable syringe, available from a vet or a farm supplies shop. Pull the plunger, spoon in grease from the tub (I use a 5" steel ruler) and refit the plunger. 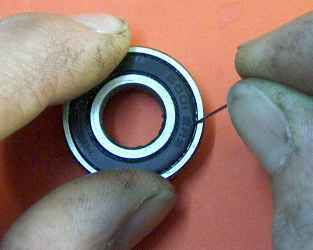 An emergency spoke is usefull for a temporary repair of a broken driveside spoke, without having first to remove the freewheel or cassette. 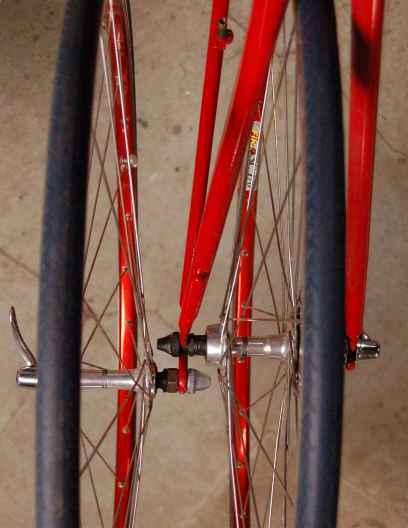 insert the spoke, clamp the bend with pliers or vice against the flatstock, and bend the second 90 degree bend.. Many hubs (e.g. all Shimano hubs) are equipped with cup and cone bearings. These hubs are supplied new with zero adjusted play, as otherwise wheelbuilding would be impossible. 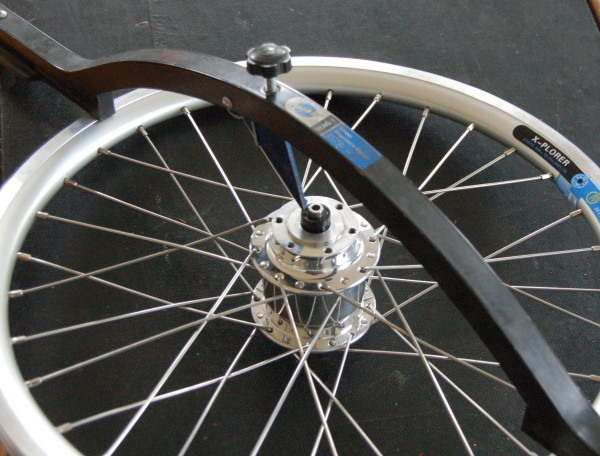 However, when installed, the tension of the quick release skewer compresses the axle and subsequently most hubs are run with the bearings very tight. After wheelbuilding the bearings should be loosend a bit, but by how much? You could try to guess, but actually it is very easy to adjust the bearing with the with the axle compressed. get a large nut: M 12 is a good size Alternatively you could drill a 10 mm hole in a 10 x 25 mm piece of flatstock, which has the advantage that you can clamp it in a vise (most skewers are wider than a M12 nut, making clamping awkward). I use an old crank. turn the axle with your fingers and be surprised! adjust the bearingplay with the cup and cone on the adjusterside. Depending on the hub you will need one or two special flat conespanners. The rubber ring is now compressed which closes up the hole, improving the fit. Threads, stems and seatposts should be greased before assembly to prevent corrosion. However a tub of grease on the workbench will become a mess in very short order. The solution is to use small plastic 35mm filmcanister with a hole drilled in the lid. Fill the pot with grease, and stick a short brush through the top. Instead of grease you could also use anti-seeze compound: this has superior anti-corrosive properties, is more pleasant to work with, and not as greasy. Never-Seez is often found at industrial supplyhouses, Shimano Lok-not can be sourced at the cycleshop. Standard containers are far to large for the average home-mechanic, so maybe you can get a refill for your small pot if you ask nicely.